Clan Johnston/e in America participates in various Scottish games and festivals throughout North America as well as other activities which foster awareness of Scottish and Clan history and culture. We publish a quarterly newsletter, the Spur and Phoenix, and collect historical and genealogical information about the Clan and other matters of Scottish interest. We also provide scholarships to study the Scottish arts, such as piping, drumming and highland dancing, and make available to members and others tartan and Clan-related merchandise. Come join us in celebrating our Scottish heritage! Please contact the President if you would like to become more actively involved, or if you have special skills which could be of use to our Clan. Clan Johnston/e in America has been recognized by the U.S. Internal Revenue Service as an educational and charitable organization which is exempt from taxation under Section 501(c)(3) of the Internal Revenue Code of 1986. 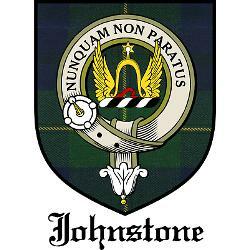 Please feel free to email a request for information info.clanjohnstone@gmail.com, use the links below to explore Clan Johnston/e in America and the history of the Scottish Johnstons and Johnstones, and support our organization by making an online donation through PayPal. Our Genealogist is Barbara Hockman of Shawnee, Kansas, e-mail: barbara.hockman@gmail.com. 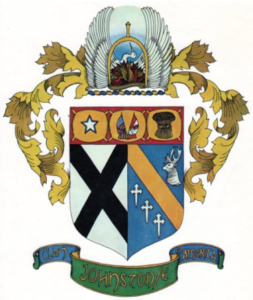 Those tracing roots and lineage beyond documents and records may find the J/J/J (Johnson/Johnston/Johnstone) Surname DNA Project of particular interest. 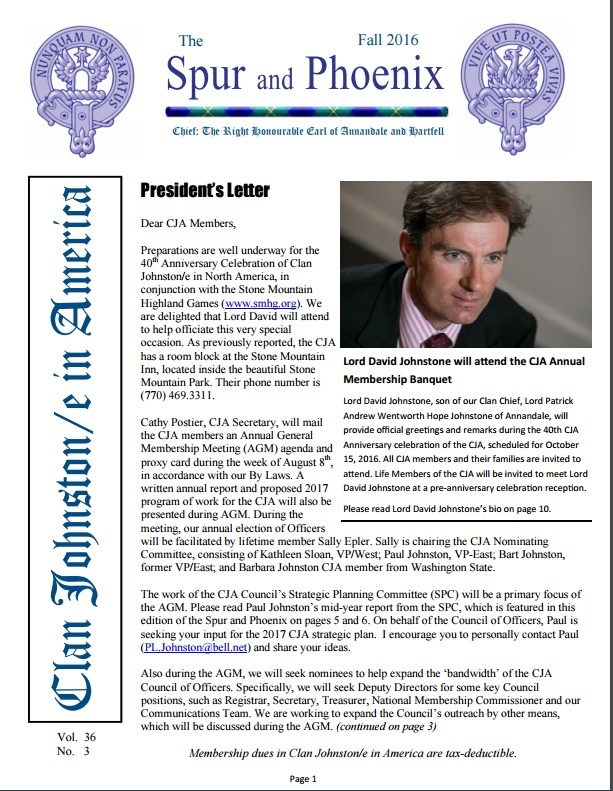 As a member driven organization, Clan Johnston/e in America and Canada is only as strong as its member support. We are currently looking for member-volunteers to fill the following positions. Most positions take less than an hour a month, with meetings typically held using “Skype”. Buz Johnson Assist the National Membership Commissioner in recruiting new members, and coordinating our Clan representation (Tent Hosts) at various games and festivals across the countries. Leamon Johnston Assist the Registrar in maintaining membership records, and processing annual renewals and dues. This includes notifying the members regarding renewals and issuing membership cards. Looking for CPA Experienced Member Assist the Treasurer in keeping correct and complete books and records of all accounts. The Treasurer also manages banking, investments, and the Clan’s annual budget, as well as preparing the annual financial report, and nonprofit tax submissions. Lynn Johnson Pace Assist the Secretary in keeping records for all Clan proceedings, and conducting official correspondence as directed by the President and Council. This includes preparing the Annual General Meeting information package. Barbara Gorham Johnson Assist the Clan Genealogist in maintaining and making available archival materials and genealogical information, as well as helping members achieve accuracy and good documentation in their genealogical research. Urgent Need! Assist the Editor in editing, publishing, and mailing the quarterly Spur & Phoenix newsletter. Seeking Members The Nominating Committee meets annually to review and approve nominees for election of pending Council positions. Membership Committee The Membership Committee meets quarterly or as needed to devise policies and methods for recruiting new members, subject to Council approval. They also manage the coverage of Tent Hosts at various games and festivals, working with the State/Provincial Commissioners. Social Media Committee The Social Media Committee meets quarterly or as needed to manage Clan information across our web, Facebook, and print platforms. They are also responsible for developing and managing platforms. Genealogy Committee The Genealogy Committee meets quarterly or as needed to manage member genealogical information and archives, and add them to our database, as well as respond to member inquiries. They also prepare articles for the Spur & Phoenix newsletter promoting accuracy and good documentation in genealogical research. Scholarship Committee This new committee is being formed to establish policies and funding for awarding Scholarships to deserving CJA members and their families. We need tent hosts for every State and Province! Tent hosts are responsible for representing our Clan at various games and festivals across the countries. They will typically set up a tent and display items of interest, and respond to questions related to the Johnston/e Clan. Hosts are encouraged to recruit new members using various incentives, but mostly it’s a fun, sociable day meeting new people and renewing old acquaintances, all in celebration of our heritage. If you are able to volunteer your time, please contact your Clan at volunteer.clanjohnstone@gmail.com noting the position you wish to fill, your member number, and a brief note regarding your qualifications.